1. Line the base and sides of a 20cm round cake tin with a double layer of baking parchment. Wrap the tin with brown parcel paper or newspaper and tie with oven-proof string. This will stop the sides cooking too much. 2. Place the dried fruits, butter, sugar, golden syrup and amaretto into a large saucepan over a medium heat. Heat gently, stirring all the time until the butter melts. Simmer for around 10 minutes, and then leave to cool for 20 minutes. 3. Combine the flour, ground almonds, mixed spice and cocoa powder in a small bowl. Beat the eggs into the now cooled fruit mix, and then stir in the dry ingredients until well combined. Pour into the tin and bake for 1 ¾ – 2 hours, or until a skewer inserted comes out clean. Leave to cool completely in the tin. 4. Pierce small holes over the surface of the fruitcake and feed with a few tablespoons of amaretto by brushing the alcohol over the cake with a pastry brush. 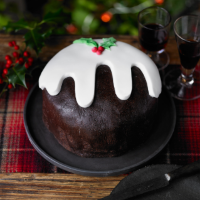 Leave overnight to dry if decorating straight away, however this cake improves with age so I would recommend wrapping in clingfilm, then tin foil, and storing for a few weeks or months. Every 2 weeks, unwrap the cake and feed with more alcohol. 5. Before you come to assemble the cake, make the marzipan. Blitz the almonds, icing sugar, cocoa powder and caster sugar in a food processor until finely powdered. Add the egg and egg yolk, and then continue to blend until the mixture comes together into one clump. Wrap the marzipan in clingfilm and chill in the fridge if you aren’t covering the cake straight away – it will keep for a week. 6. Place the cake top down onto a cake board. It probably won’t sit completely flat, so make small sausage shapes from the chocolate marzipan and use them to fill in any gaps, so you have a smooth and even cake. 7. Roll the marzipan into a large enough circle that will cover the top and sides of the cake between two pieces of clingfilm. Using clingfilm makes it really easy to move the thin layer over the cake when you come to assemble, and also stops it from drying out. 8. Heat the jam in a small saucepan until liquid, then use a pastry brush to cover the outside of the cake with a thin layer of jam. 9. Peel the top layer of clingfilm off the marzipan, and then flip the sheet over the cake. Use your hands or a cake smoother to apply it over the top and sides of the cake, pressing firmly to make sure it sticks. When you are happy with the covering, remove the second layer of clingfilm. Allow the marzipan to dry completely before icing. 10. Roll the fondant out into a 25 x 40cm rectangle shape. Use a sharp knife to cut a large wiggly line into one of the long sides. This will form the drips, so try to vary the sizes of the wiggles for a more authentic look. 11. Brush the half the cake (top and sides) with amaretto, then apply the fondant icing to half the cake. Press the sides on first, and then arrange the drips until you are happy. 12. Colour a tiny amount of the leftover fondant green, and an even smaller amount red. Make two holly leaves and three red berries, and then use a little water to stick them to the top of the cake. The finished cake will keep for 1-2 months if stored wrapped loosely in foil in a cool, dark place.